Given the high costs associated with almost all forms of delivery—shipping, trucking and aviation—its not surprising that industries are exploring how drones can augment traditional delivery methods to reduce costs. Drones are serious business. In fact, drones are very big business. Unmanned Aerial Vehicles (UAVs), commonly known as aerial drones, are transforming traditional supply chain delivery. Given the high costs associated with almost all forms of delivery—shipping, trucking and aviation—it’s not surprising that industries are exploring how drones can augment traditional delivery methods to reduce costs. Aerial drones will also enable new types of services, open new delivery routes, and make it practical to serve hard-to-reach communities. There are, however, still many concerns about high-volume commercial drones, including safety, security and reliability. All of these issues are addressed with fog computing (IEEE 1934™). A fog infrastructure is a system-level hierarchical infrastructure deployed between the cloud and edge (or “things” in the Internet of Things). A fog computing architecture distributes compute, storage, networking, security and other functions across a hierarchy of fog nodes. In supply chain delivery, each aerial drone is a fog node (specifically, a mobile fog node). 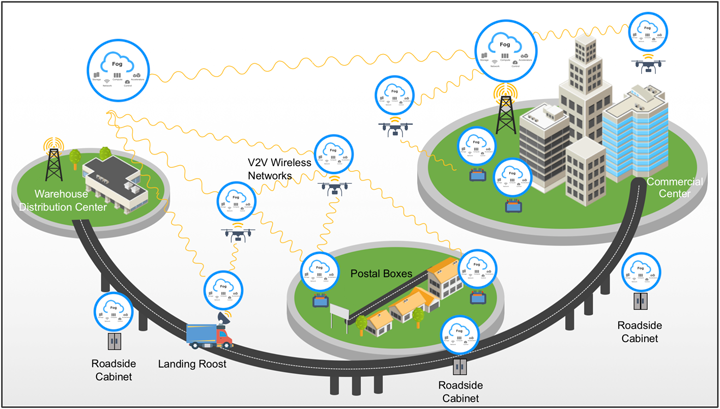 Following are different ways that fog computing enables supply chain delivery with aerial drones. Consider that the time it takes for a message (like an instruction to change course) to pass from an aerial drone to the cloud is around 80 milliseconds. During the time between round-trip cloud messages, the drone travels about 12 feet. That turnaround time can result in serious safety issues. Fog-enabled drones are capable of autonomous awareness, analysis and sub-millisecond response to things like changing weather conditions and other aircraft. You would think that using drones to travel through or reach remote areas for delivery would be an ideal use case. Unfortunately, drones have to rely on satellite links for communication, which makes this use case cost-prohibitive. Instead, fog-enabled drones can access regional fog nodes (part of the ground infrastructure, which I’ll discuss later) for updates on airspace and other environmental conditions. This eliminates reliance on satellite links and makes deliveries to remote communities and over new routes a practical reality. Multiple drones can be preprogrammed for cooperative behavior, such as working together to carry a large package. But there are limitations to relying on preprogramming cooperative behavior. Fog nodes are self-aware, peer-aware and self-organizing, which makes dynamic community behavior possible. While drones are working cooperatively, they maintain their individual autonomy (which means each drone can sense and act intelligently to ensure the success of the shared task). Here’s an example: four drones are working together to deliver a heavy package. One of the drones begins to display anomalous behavior, such as losing altitude. The other drones don’t have to know the reason for the behavior. What is important is that the drones are capable of inflight reprogramming in near real time. Because time may be of the essence with fast-moving drones, this inflight reprogramming must be autonomous—that is, without requiring intervention from any ground support systems. In this scenario, the other three drones may increase their power output to compensate for the faltering drone and maintain the correct altitude. When connectivity to the cloud or the ground support infrastructure is limited, intermittent or lost, drones can’t act erratically because they lack instructions. One of the architectural pillars of fog computing is autonomy, which encompasses situational awareness, analysis and sub-millisecond response to changing conditions. The mobile fog nodes provide on-board intelligence so that the drone can act with autonomy when needed. Drone fleets are an essential concept in supply chain delivery. Fleet behavior is enabled, in part, by the multi-tenancy properties of fog computing. A fog node on a drone may have application software owned by more than one stakeholder on a time-sharing basis. Fog computing multi-tenancy also handles the variability inherent in multi-tenancy. For example, one tenant may require that its data is held in strict privacy, while another tenant may require selective sharing of its data. For local deliveries, individual fog-enabled drones can department from warehouses or trucks equipped with landing platforms. There is a constant handoff of information along the supply chain route between drones and the ground support infrastructure. One last word about aerial drones: It’s important to note that fog-enabled drones work in conjunction with a ground support infrastructure. Ground-based fog nodes can be anywhere—co-located with or embedded in devices on street corners and rooftops in smart cities and towers along flight routes. This hierarchical, distributed model of fog computing (from the ground to the air) enables complex, split-second coordination of landings, takeoffs, flight path management, loading, unloading, maintenance and myriad other tasks associated with commercial drone operations for supply chain delivery.